Enter Fort Uncompahgre through the Visitor Center, bookstore, and information center. Here you will find answers to questions about what to see and do in the area, local events and history. Our gift shop sells items similar to the historic trade goods found in The Fort and books on the history of Fort Uncompahgre, The Old Spanish Trail, and the Western Slope of Colorado. After leaving the Visitor Center, stroll down the tree lined pathway to The Fort. On the left is the pathway to the reconstruction of a Trapper’s Cabin. Fur trappers engaged in a seasonal occupation. When winter cold froze the streams and snow blocked access to streams and trails, trappers would hole up for the winter. 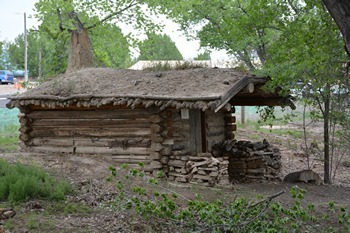 The Trapper’s Cabin is an example of a simple living structure that provided shelter during the coldest months. 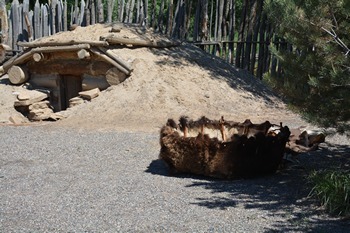 On the outside of the fort stockade, tepees are erected on a seasonal basis. The gates to The Fort are ahead. To the right of the front gate is the Horno. The beehive shaped adobe oven (called an Horno in Spanish) is a design dating back to lat least 1,400 B.C. when similar structures were used by various Middle Eastern cultures. A fire is built inside and allowed to burn for three or four hours. Afterwards the remaining coals and ashes are cleaned out. Each owner had a way of knowing when her oven was at exactly the right temperature at which time she would put her unbaked loaves of flat bread inside and close the door. It seldom took more than twenty minutes for the bread to bake. The open fire pit beside the horno would have been used during hot weather for daily cooking chores. At any one time Fort Uncompahgre would have had from fifteen to twenty-five individuals living and working out of the post. All employees were Mexican from the Santa Fe and Taos areas. Robidoux spent long periods away from Fort Uncompahgre and left, in charge, either one of his brothers or a clerk and one of the older, more experienced employess. It was generally this individual who would bring his wife to serve as the Fort cook. The kitchen or cocina, as it was known in Spanish, also served as living quarters for the couple. Days began early with bedding being rolled up and placed against a wall. Fires were started and preparations for the first meal of the day were undertaken. It generally took from three to four hours to prepare so the men could usually expect to be called in about mid-morning. Space was always a t a premium so important individuals and guests ate first, followed by their lesser ranked comrades then women, if there were any, and finally children if they happened to be present. A second and final meal was served about four in the afternoon. With exception of salt, sugar, spices, tea and coffee, most foodstuffs were locally grown in the small irrigated plots near the river. It is likely that fruit trees were also brought in and planted during the early years of the Fort. Meat was supplied either by locally grown livestock or by hunting wild game. 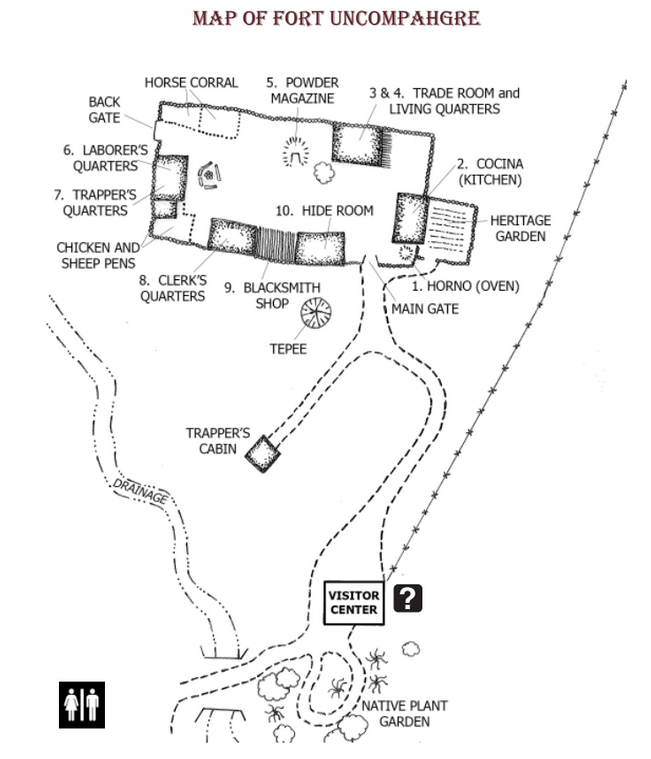 Fort Uncompahgre would most likely have had an open trade room such as the one you see with trade goods in open view. Larger forts in the east and north tended to have merchandise under tighter security by restricting access to little more than a hole in the trade room wall through which the customer could peer in. Most trade goods were collected in St. Louis or later, St. Joseph, Missouri, where they were loaded into wagons for the journey to Santa Fe over the Santa Fe Trail. To protect the trade goods from the elements and 700 miles in a wagon without springs, they were packed in boxes or barrels. Delicate items were surrounded with cornmeal that could also be sold at the end of the trail. Goods like cloth were first wrapped in brown paper and tied with string. Samples of cloth would be attached to the outside of the package to identify the contents. Once trade goods reached Santa Fe and tariffs (which reached twenty percent) were paid, they could be loaded on carts for the trip north into the San Luis Valley. There is evidence that Robidoux kept carts at the base of Cochetopa Pass and moved his goods on to pack mules for the final journey over the North Branch to Fort Uncompahgre. Transporting goods across the mountains with afternoon rains and high rivers was a challenge met by highly skilled Mexican packers who saw to it that a bolt of cloth arrived in the same clean and starched condition that it had left the mills. Ute women demanded nothing less. Surviving trade manifests indicate that, by volume, rearly eighty percent of the trade went to the women. The list includes calico cloth, flannel, French denim, colored ribbons, thread, needles and scissors. There were knives, hatchets, and metal cooking ware, plates, and tin cups. Traders introduced tea (which came in pressed blocks) and raw coffee beans. Mexican chocolate, a variety of spices and sugar were also popular. To introduce new customers to sugar, the trader simply suspended a cone of sugar on a string as has been done here and would invite a potential customer to bite off a sample. To the west of the Trade Room is the underground bunker where the powder was stored. Gunpowder was stored in an underground bunker so that in the event of an explosion, the force of the blast would be directed upwards and away from the surrounding structures. 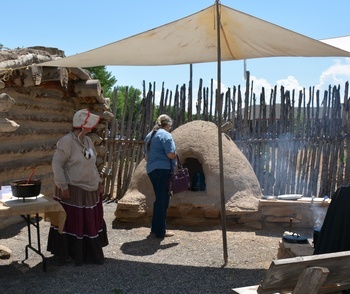 The Smith at Fort Uncompahgre would have made his own forge from sun-baked adobe block cemented together with mud. He made charcoal to use as fuel, unaware of the vast supplies of coal in the North Fork Valley. To bring the fire to operating temperature he would have needed a billows made of wood and leather. This too would have been fabricated at the Fort. Beyond his anvil, hammer and a few specialty items, most of his tools would have also been made on site. Consequently, a blacksmith was of supreme importance at the Fort. His primary responsibility was to keep the pack mules shod. Beyond that he made hinges, door fasteners and other items necessary to daily life. He also made many of the items used by the cook, including fire irons and various items of cookware. 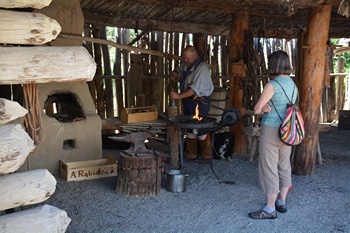 Native people were always fascinated with a blacksmith and enjoyed watching one work. As a skilled craftsman, the blacksmith ranked higher on the local social hierarchy than did other laborers. He was usually one of the first to eat and cooks tended to give a blacksmith better portions because they never knew when a favor might be needed. A smith typically was paid two and a half times the prevailing wage of common laborers. In larger trading posts he often worked alongside a carpenter, but at Fort Uncompahgre it is likely the blacksmith also handled whatever was needed in that respect- principally the repair of casks and buckets. 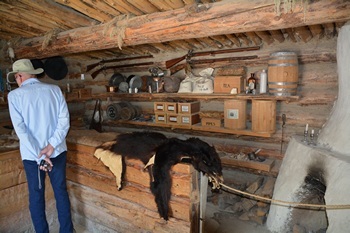 A custom was established for each trading fort to keep one room open for visitors. 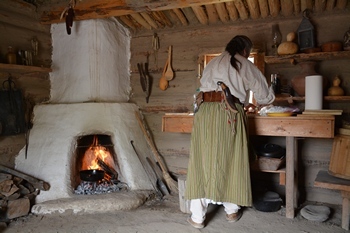 Although it was usually called the “Trapper’s Quarters,” it was open to anyone who visited. Travelers carried their own bedrolls so they only needed a place to lay them out of the weather. As guests they were considered important enough to be allowed to eat first with the important men at the post. The isolation of western life at that time made any source of outside news more than welcome. “It has a motley garrison of Canadian and Spanish engage’s and hunters, with the usual number of Indian women. We obtained a small supply of sugar and coffee, with some dried meat and a cow, which was a very acceptable change from the pinoli on which we had subsisted for some weeks past. I strengthened by party at this place by the addition of Auguste Archambeau, an excellent vorageur and hunter, belonging to the class of Carson and Godey.” 1 Such hospitality was an integrated part of the western code at the time. Most individuals knew they could count on receiving help almost anywhere they went. They also knew they were expected to provide the same when placed in a position to do so.